Paolo Veronese (1528–1588), The Allegory of Love, Respect (detail) (c 1575), oil on canvas, 186.1 x 194.3 cm, The National Gallery, London. Wikimedia Commons. Wherever we use metallic copper, it weathers and corrodes. As most copper salts are blue-green in colour, ‘copper rust’ turns statues, rooves, pipes, and every other copper object exposed to the air steadly blue-green. Before recorded history, people noticed that the colour produced by exposing copper to vinegar (acetic acid) was a useful pigment. Thus green Verdigris (copper acetate) became used as a pigment. Green is a vital colour in painting. Although not a primary colour, it is commonplace in nature. There’s a well-known principle in the use of pigments that you should mix the fewest different pigments to achieve a given colour; the more pigments that you use, the muddier the colour will be, until its hue is eventually lost in a muddy mid-grey. So, although you can always make greens from a mixture of blue and yellow, if you’re painting a landscape, or brilliant green garments, or a still life with leaves, you’ll welcome a good green pigment. Verdigris was easy and cheap to produce. In Europe, its manufacture centred around Montpellier, in the south of France, where there was a plentiful supply of waste products from winemaking to provide vinegar. By the seventeenth century, consumption of copper there had to be satisfied by imports from as far away as Sweden. Verdigris production was also unusual in being predominantly the work of women. Verdigris is typically more blue when it is first applied, and develops its full green hue over the first month or so following application. 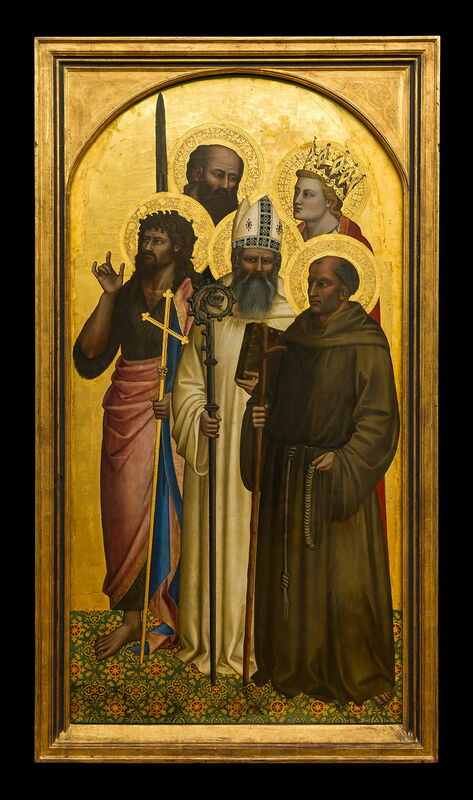 Nardo di Cione (1320–1366), The Saints John the Baptist, Egidius, Gerard of Villamagna, Paul and Catherine (or Miniato) (c 1350), oil on panel, 142 × 70.3 cm, Alte Pinakothek, Munich, Germany. Wikimedia Commons. Nardo di Cione’s The Saints John the Baptist, Egidius, Gerard of Villamagna, Paul and Catherine (or Miniato) from about 1350 is one of the earlier paintings known to use Verdigris, presumably in the intricately patterned floor. It may also have been used in the habit of Saint Paul. Michael Pacher (1435–1498), Altarpiece of the Church Fathers (1471-1475), colour on wood, 103 × 91 cm, Alte Pinakothek, Munich, Germany. Wikimedia Commons. One of the earliest paintings to show the full capabilities of Verdigris is Michael Pacher’s Altarpiece of the Church Fathers which was painted between 1471-75. The founding fathers shown are, from the left, Jerome, Augustine, Gregory, and Ambrose. Although Pacher uses Verdigris in each of the panels, that of Ambrose (shown below) demonstrates the brilliant green which can result. 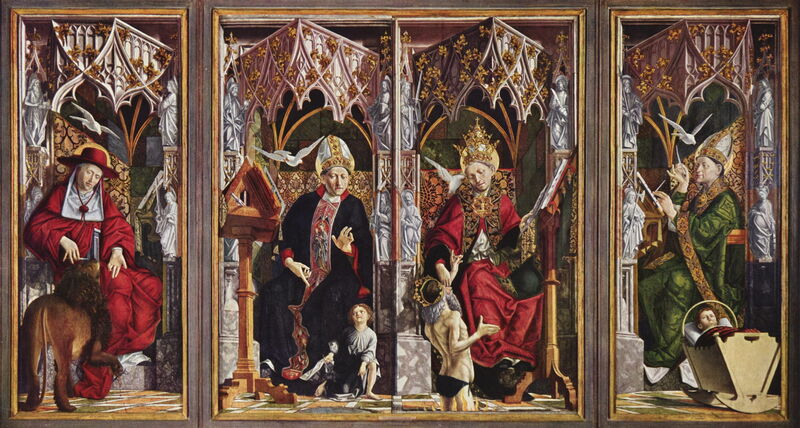 Michael Pacher (1435–1498), Altarpiece of the Church Fathers (detail, St Ambrose) (1471-1475), colour on wood, 103 × 91 cm, Alte Pinakothek, Munich, Germany. Wikimedia Commons. Piero di Cosimo (1462–1522), The Myth of Prometheus (detail) (c 1510), oil on panel, 68 × 120 cm, Alte Pinakothek, Munich, Germany. Wikimedia Commons. For much of the period that Verdigris was in common use, the only real alternative was Green Earth, which could never attain the same chromatic intensity. 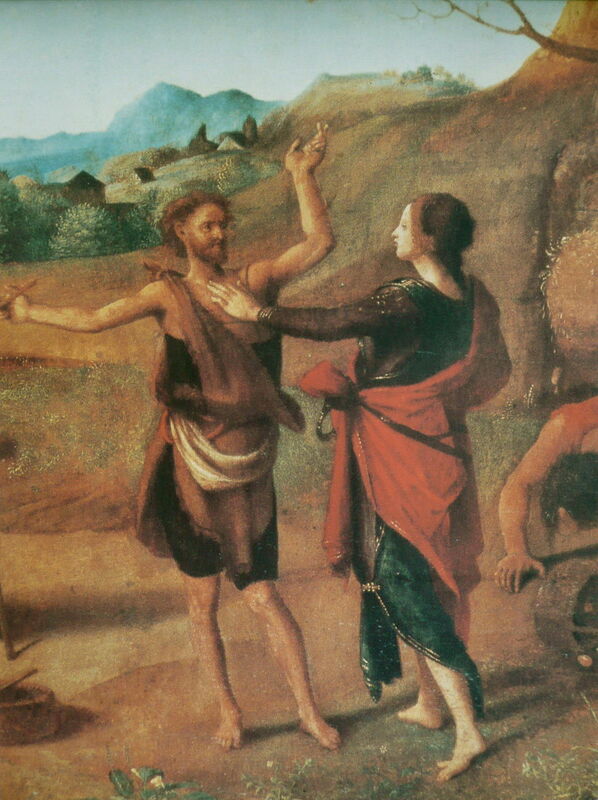 This detail from Piero di Cosimo’s The Myth of Prometheus from about 1510 shows Verdigris in another intensely green garment, and probably in the distant vegetation too. 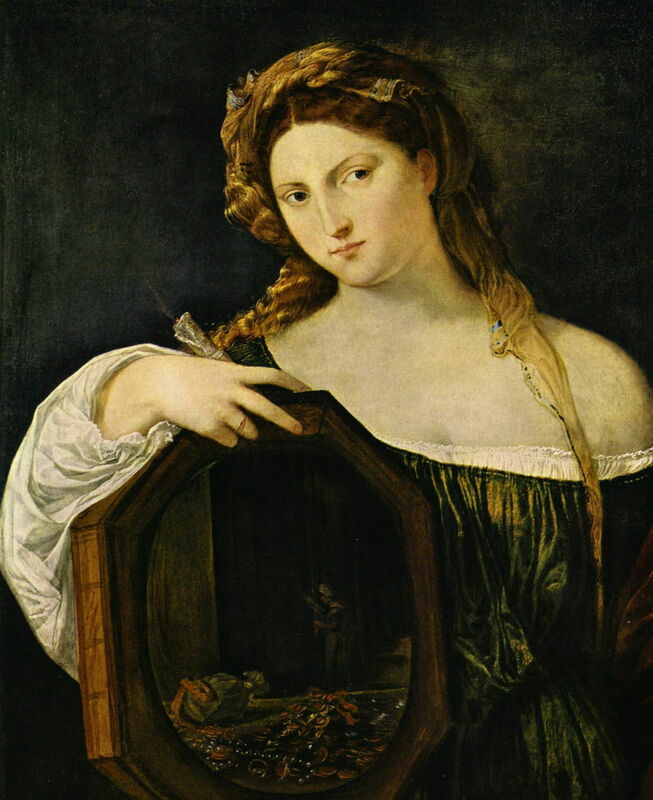 Titian (c 1488/90–1576), Vanity (c 1515), oil on canvas, 97 × 81.2 cm, Alte Pinakothek, Munich, Germany. Wikimedia Commons. Several of Titian’s works have been found to include Verdigris, including his unusual Vanity (c 1515), where it most probably appears in the green dress. Albrecht Altdorfer (1480–1538), The Battle of Issus (1529), colour on lime, 158.4 x 120.3 cm, Alte Pinakothek, Munich, Germany. Wikimedia Commons. 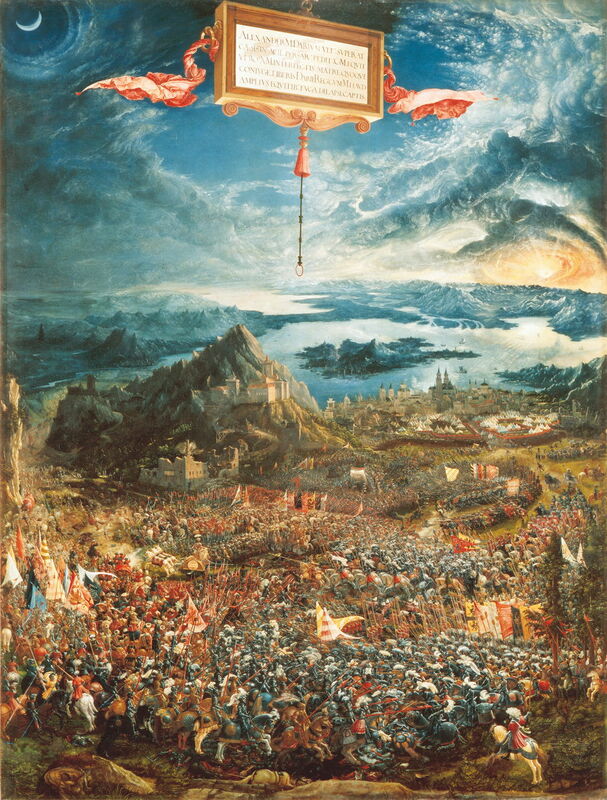 Verdigris has also been found in Albrecht Altdorfer’s panoramic ‘world view’ of The Battle of Issus (1529). 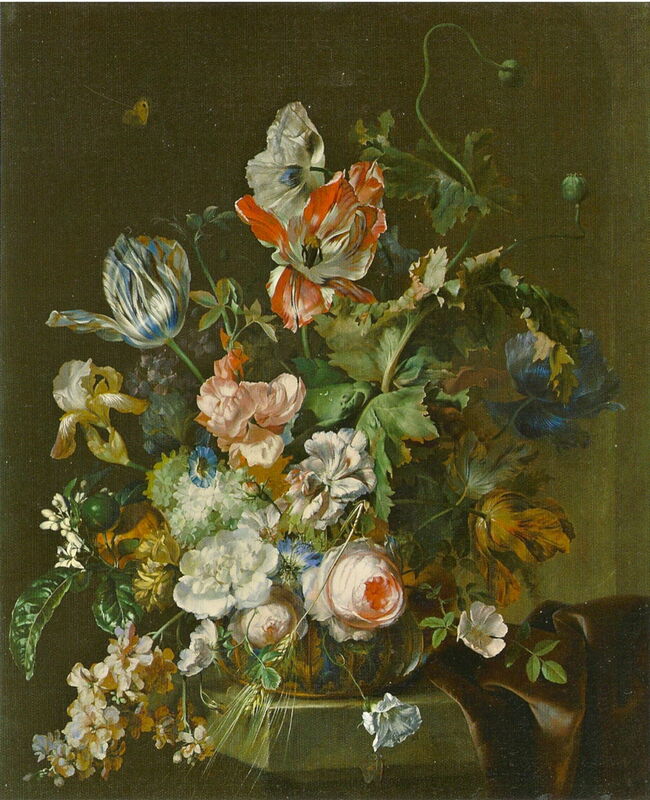 Herman van der Mijn (1684–1741), Garden Flowers (1715), oil on canvas, 78 × 64 cm, Staatsgalerie im Neuen Schloss Bayreuth, Zweiggalerie der Bayerischen Staatsgemäldesammlungen, Bayreuth, Germany. Wikimedia Commons. One of its later uses is in Herman van der Mijn’s Garden Flowers (1715), where a range of natural-looking greens was clearly essential. Verdigris was also known as an accelerant of the drying of oil paint, and was frequently added to dark and black paints, which are notoriously slow to dry, in order to shorten their drying time. Many paint samples from dark or black passages have therefore been found to contain Verdigris, although it there has no function as a pigment. During the late eighteenth and early nineteenth centuries, Verdigris was replaced by better, brighter greens, such as Prussian Green (mixed using Prussian Blue after 1708), Scheele’s Green (1775), Emerald Green (1814) and Viridian (1859). From the fifteenth century onwards, Verdigris pigment was mixed with natural resins for use in glazes. This produces a different pigment from normal Verdigris, as the copper combines with the resin acids to form what is known as Copper Resinate. A popular technique among many Masters to produce an intense green was to paint an underlayer using Verdigris, over which several glazing layers of Copper Resinate were then applied. Although generally reliable and stable, Verdigris and Copper Resinates have a tendency to turn brown on the surface. Thankfully this affects relatively few paintings. Tintoretto (1519–1594), Saint George and the Dragon (c 1555), oil on canvas, 158.3 x 100.5 cm, The National Gallery, London. Wikimedia Commons. 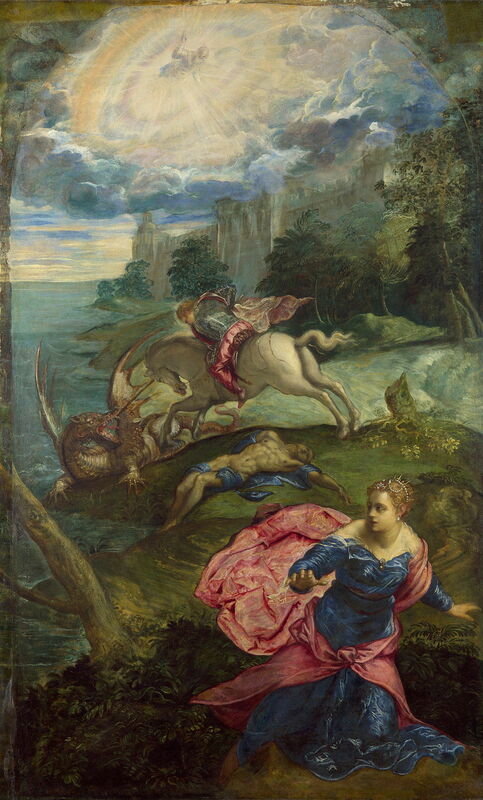 Tintoretto used Copper Resinate glazes in several of his paintings, most notably the rich, varied, and often lush vegetation in his Saint George and the Dragon from about 1555. Paolo Veronese (1528–1588), The Allegory of Love, Respect (c 1575), oil on canvas, 186.1 x 194.3 cm, The National Gallery, London. Wikimedia Commons. 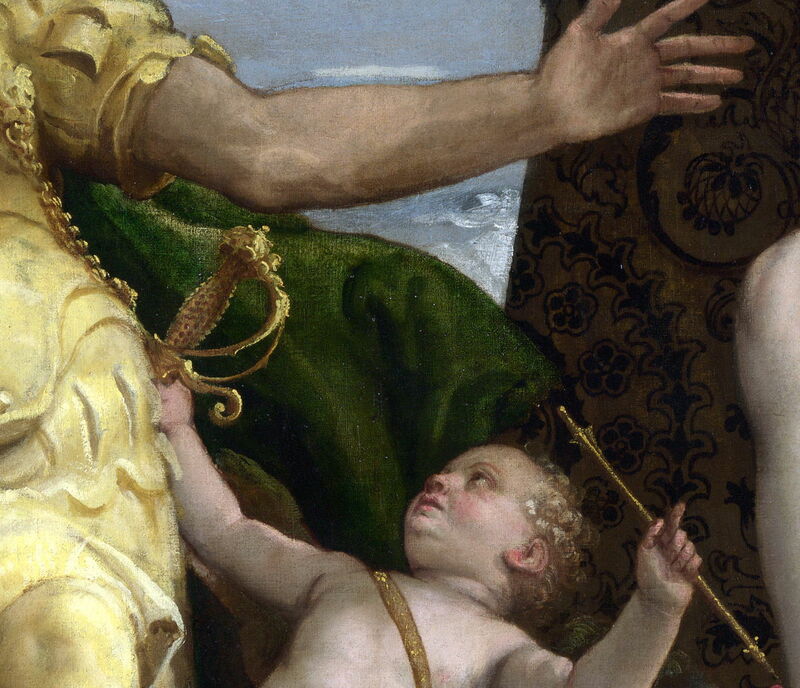 Studies at the National Gallery, London, have found Copper Resinate in three of the four paintings in Paolo Veronese’s series The Allegory of Love. In the third of these, Respect (c 1575), the pigment was found in the man’s intense green cloak, and the duller gold-brown brocade patterning on the wall behind his hand (detail, below). The surface of that wall has superficial brown discoloration of the paint layer. 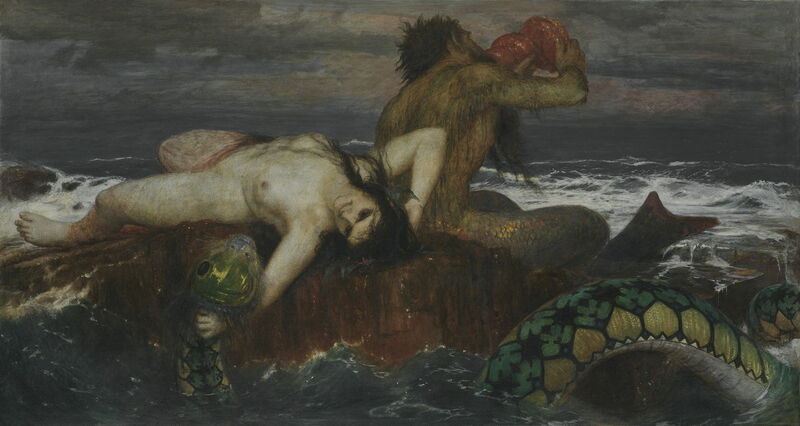 Arnold Böcklin (1827–1901), Triton and Nereid (1874), tempera on canvas, 105.3 × 194 cm, Sammlung Schack, Bayerische Staatsgemäldesammlungen, Munich, Germany. Wikimedia Commons. One of the last major uses of Copper Resinate is in Arnold Böcklin’s Triton and Nereid from 1874. This is reported as being painted in tempera, but Copper Resinate glaze appears to have been used to develop the intense green patterns on the sea monster in the foreground. This is consistent with Böcklin adhering to traditional techniques despite working in the late nineteenth century. True Verdigris gradually vanished from the palette during the early twentieth century. However, there’s still nothing quite like the intense green which was achieved by glazing Copper Resinate over a base of Verdigris. Posted in General, Life, Painting, Technology and tagged Altdorfer, artists paints, Böcklin, di Cione, di Cosimo, history of painting, Pacher, painting, Piero, pigments, Tintoretto, Titian, van der Mijn, Veronese. Bookmark the permalink.